A native of Colombia, reedman, clinician, composer and arranger, Justo Almario has fused Latin, Afro-Cuban, South American, Funk and Jazz genres into his own humble offering. Mr. Almario studied at the prestigious Berklee School of Music before a stint with Mongo Santamaria as the band’s musical director. Justo has also performed with Patrice Rushenís Grammy Awards Orchestra, Freddie Hubbard, Roy Ayers, George Duke, Tito Puente, Machito, Dave Grusin, Ndugu Chancler, Alex Acuna, Abraham Laboriel, TOLU, Donald Vega, Harold Land Jr. Al Mckibbon, Master P, Bebe Winans, Queen Latifah, Charles Mingus, Chaka Kahn, Linda Rondstadt, Herb Alpert, Bobby Shew, John Heard, Lorca Hart, Billy Higgins and “Jose Rizo’s Jazz on the Latin Side All-Stars”. Always in demand, Justoís complete list of credits is simply too extensive to mention. 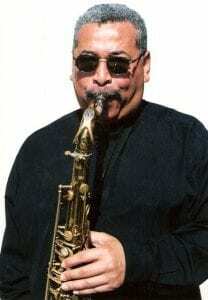 John Coltrane, Cannonball Adderly, Antonio Carlos Jobim, Bach, Bartok and Debussy are among Justo’s primary influences. After evolving from child protege to virtuoso, Almario taught at the Henry Mancini Institute and has mentored inner city youth during workshops at the World Stage. A multi-instrumentalist of the highest caliber, Mr. Almario has mastered the soprano and tenor saxophones, clarinet and flute. Justo thoroughly engages his listeners with rhythmic, call and response interludes. Although he is extremely appreciative, this modest wind wizard frequently deflects any accolades, opting instead, to thank folks for merely showing up and sharing. This is paramount to a keenly sensitive artist who warmly connects with his audience on so many levels. In 1992, while joining the ranks of Cedar Walkton, Terrence Blanchard and Joe Lovano, Almario was an integral part of the Newport Jazz Festival Tour, produced by George Wein. Two years later, four of the recordings that Justo was featured on, earned Grammy nominations while Andrae Crouch’s Mercy, and Cachao’s Master Sessions, Vol. 1î, were actual Grammy winners. Mr. Almario was featured on “Let’s Get Loud”, a Jennifer Lopez DVD. He also appeared on ‘Ahora Si’, a CD by Israel ‘Cachao’ Lopez that garnered two Grammys. No stranger to Hollywood, Justo was heard on the soundtrack of the Oscar-winning film, “Sideways”. In addition, Mr. Almario will be featured on the upcoming Andy Garcia movie, “The Lost City” and on the soon-to-be-released “Romance and Cigarettes”, produced by John Turturo and starring Susan Sarandon and James Gandolfini.